Business process management (BPM) is designed to help an organization do its job better. Read this excerpt from the Oracle Business Process Management Suite 11g Handbook to learn the basics of BPM and its benefits. How do you define business process management (BPM) in one sentence? While there are many different answers, you will likely find one common theme: BPM helps an organization to do its job better. This excerpt of Oracle Business Process Management Suite 11g Handbook, by Manoj Das, Manas Deb and Mark Wilkins, covers BPM basics, its key benefits and related BPM technologies. BPM is defined as a strategy for managing and improving the performance of a business through continuous optimization of business processes in a closed-loop cycle of modeling, execution, and measurement. BPM activities span conception and discovery through deployment and management of the execution of business processes within some appropriate governance framework. A business process is a set of linked activities performed by people and systems that deliver some business value to internal or external customers. Thus, we embrace a comprehensive scope for BPM spanning a complete life cycle and including continuous process improvement. We recognize this as a management discipline that goes beyond software development activities or the mere use of software applications. We also include related governance as a necessary element of BPM. We believe that adequate governance is required to ensure quality BPM adoption that is capable of sustained competitive advantage. In the case of the definition of a business process, we purposely avoid the restriction of any structured association of business activities. In structured processes, steps of the process and their sequence are known a priori, at least within a specified set of possible options. For many business processes this restriction does not pose any real difficulty and, in fact, makes the computer realization of the business processes simpler. A straightforward order-to-cash for simple goods, a provisioning of a telephone service, supporting back-end business processes for most Internet purchases would fall under the structured business process category. However, today’s businesses need to both improve and guarantee the quality execution of business transactions that involve rather ad hoc collections of activities where the exact number of tasks, and the exact nature of their association, including apparent task flows, are not known a priori. Business processes evolve depending on the specific context of a particular business transaction, and are based on intermediate results. As opposed to the strict sequence and prespecified branching of task flows, these transactions are guided by higher-level business norms, rules, and policies. Such transactions could also include the relatively free-form collaboration of knowledge workers as opposed to ordered human tasks familiar to traditional workflow systems. Management of these transactions can be formulated using what are called unstructured processes. Many case management activities, as well as pharmaceutical R&D and complicated risk analysis, are examples of unstructured processes. This excerpt from Oracle Business Process Management Suite 11g Handbook by Manoj Das, Manas Deb and Mark Wilkins is reprinted here with permission from Oracle Press, copyright 2012. Download a PDF of the full chapter. We would like to point out that business processes can and do exist within packaged applications like ERP, CRM, HRM, and SCM, and they can also be created in middleware that usually surround such applications. While cross-application business processes clearly sit in the middleware, situations often arise where multifaceted design and operational considerations are needed in determination of the best place for creation of a business process. Oracle BPM Suite is a middleware product (in fact, it is a part of Oracle’s Fusion Middleware family of products) and can be used to create independent business processes that can integrate with, or extend, packaged applications. It may also be useful to note that the abbreviation “BPM” is also commonly used for Business Process Modeling, Business Process Monitoring, and Business Performance Management. The first two are included in our definition of BPM, while the third is concerned with financial measures of business performance to which our BPM should ultimately contribute. Presently, most companies are highly interested in adopting BPM across their organizations to help better their organizational performance. Few companies have yet achieved maturity in their BPM initiatives, while most others are grappling with early stages of adoption. Frequent reports by leading analyst firms like Gartner, Forrester, and IDC have been indicating that the improvement in process management has been one of the top concerns of senior management for the past few years and will remain so in coming years. Analysts estimate the annual BPM spend to be in the range of 5–6 billion USD and is projected to grow at the rate of 30–40 percent per year (compare this with the projected growth rate of 5–10 percent for most other business integration software markets). All in all, BPM appears to enjoy a strong positive momentum at the present time. Thus, it would be worthwhile to dig a little deeper to see why BPM is regarded as being so beneficial to a company. As we have already noted, BPM is about managing business activities in a comprehensive way. While adopting of BPM offers many benefits, the primary motivation for using it in a given company could differ. For example, some companies may be focused on executing their activities more efficiently— that is, producing the same output with less resources like time, money, goods, and labor—while others may be more interested in creating higher business agility in order to respond better to changing market conditions. In some cases, process management may be necessary to produce sufficient visibility and create audit trails across a chain of activities so as to meet a variety of regulatory compliance requirements. Such benefits of BPM, generally speaking, can be classified as either internal or external. Internal benefits are typically efficiency, as well as worker empowerment and satisfaction, while external benefits help customers and partners derive better value from the company’s products and services. BPM delivers increased business operation efficiency by delivering integrated processes that span distributed IT functionalities and human workers. 8 Oracle Business Process Management Suite 11g Handbook An increase in the transaction execution automation level due to computerization of the process activities decreases process execution time, provides higher transaction volume capacity, and reduces human-generated errors. Collaboration facilities (as included in Oracle BPM Suite 11g) make complex exception handling much easier and cheaper, thus contributing toward higher productivity and efficiency. Better visibility over a business transaction requires adequate monitoring of the underlying process. A process may be monitored at the top level to get general health-check data about the transactions relating to that process—for example, how many transactions are underway and how many are at what state of completion, ranges of process completion times, and fall-out percentages. Often these are the types of information that senior management are interested in. The process designers or those interested in continuous process improvement, on the other hand, would also like to track several performance parameters associated with the individual activities and responses of the performance of the edge applications that the process connects to. IT operations teams are generally concerned with system level performance of software and hardware, information regarding quick fault detection, and providing the expected level of service of the running systems for support of business continuity. Sales and marketing people would be interested in up-sell and cross-sell opportunities associated with a customer and his or her transactions. Explicit and digital description of the process showing all associated activities, rules and end systems, and events generated by the running business process instances are great facilitators of process visibility. Once all the activities in a process-based transaction are tractable, the creation of audit trails or the generation of alerts for use with compliance procedures also becomes easy. Process analyzers built into the BPMS (as in Oracle BPM Suite 11g) or companion tools like Business Activity Monitoring (for example, Oracle BAM) or Business Intelligence (for instance, Oracle BI) can be used to visualize a variety of process information easily. High business agility has become an essential quality of the winning companies in today’s globally competitive marketplace. Agility has to do with responding to planned and unplanned changes in business execution quickly; business processes are often an ideal place to orchestrate such changes. Collaborating business and IT participants can quickly modify existing processes as may be needed by the change imperatives. Also, reuse of either subprocesses or services (at process end points) can greatly reduce the response time to handle change. Use of externalized and hot-deployable business rules that can alter some aspects of the process execution (as is possible in Oracle BPM Suite 11g) is another way to increase business agility since some of the process changes can be incorporated directly by the business analysts without requiring long and expensive IT development projects. 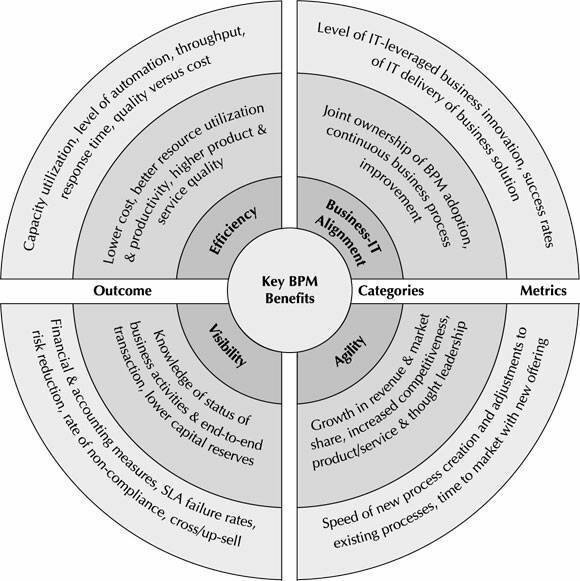 Figure 1-1 summarizes the key BPM benefit categories, along with some of the typical metrics that can be used to monitor the benefit levels actually achieved. Manoj Das is senior manager in the product management group for Oracle Fusion Middleware. His focus is on BPEL and Business Rules. Manoj joined Oracle from the Siebel acquisition where he was responsible for driving the next generation process-centric application platform. Manas Deb is a senior director in the Fusion Middleware/SOA, BPM, Governance Suites Product Group at Oracle. He currently leads outbound product management and many strategic engagement initiatives for Oracle's SOA, BPM and Governance solutions worldwide. Mark Wilkins is an enterprise architect for Oracle’s Global Enterprise Architecture Program where he works across product lines to develop BPM strategies. Mark joined Oracle from BEA where he was instrumental in developing Service Oriented Architecture methods and service offerings.